This manual is about proven principles of success in metal fabrication. The material presented is practical and in-use, as the examples will show. 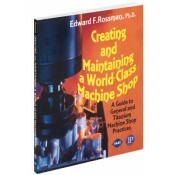 While the primary focus of this book is on machining titanium, many of the items discussed could apply to any machining or manufacturing enterprise.The look and feel of a world-class shop is described with many examples. If you own, manage, or work at a general or titanium machine shop, or at virtually any metal fabrication shop, you will find yourself referring to this manual over and over again!